Defender's PHOENIX 301 system can be used to monitor and record video and audio in any indoor or outdoor space at any time of the day. 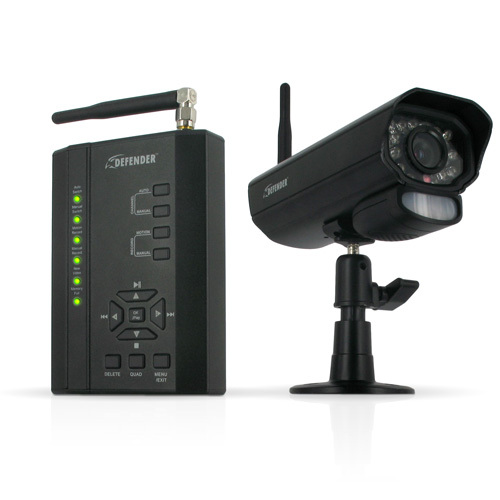 This wireless plug and play system allows for easy set up in a matter of minutes and the included 2GB SD card can record up to 350 minutes of continuous audio and video footage. The wireless, weather resistant camera included with this system has 18 infrared LEDs that allow you to see up to 40ft away in the dark. This system includes a compact receiver that easily connects to any television in your home or business using the included A/V cable. Ideal for monitoring entrances, backyards, valuables and employees, this PHOENIX 301 system can be used in any situation you need. The Phoenix 301 series allows you to easily secure several vulnerable spots on your property. This system can support a total of 4 cameras so you can monitor multiple offices, entrances and other outdoor areas. The compatible camera is Defender's PX301-C. The Phoenix 301 series comes equipped with Digital Wireless Technology that ensures there is no messy wiring involved when setting the system up. This advanced system automatically connects on its own so you will be watching clear, interference-free footage in a matter of seconds. Superior digital functionality ensures that the signals passing between the camera and receiver remain strong as you monitor your business or home wirelessly, up to 450ft away. The included indoor/outdoor wireless color camera provides you with clear, crisp and enhanced video. Built for indoor or outdoor use, the camera's durable aluminum housing resists rusting, deterioration and can weather any season. The attached sun shield helps prevent glare from the sun and other bright objects. The camera also has a built-in motion sensor so that you can be sure you will always be alerted when motion is detected. Motion settings give you flexibility so you can choose when the unit will start recording. You have many options, such as recording only when movement is detected. Using these easy-to-adjust settings will conserve your SD memory space so you can monitor longer. Simply turn on the motion recording and when the camera detects movement the unit will begin recording. You can even set the system to sound an audible alert to notify you that motion is being detected. Set up your preferred scheduled recording time throughout a 24-hour day. Record during peak business hours or when you're not at home so you never miss a thing. This system allows you to record video footage using three different types of recording modes: manual, scheduled, and motion activation. Control your system directly from the buttons on the receiver or from a distance with the included remote control. This system also comes equipped with an IR extension wire which allows your remote control to reach further and makes your system even more user friendly. IR illumination range up to 40ft under ideal conditions. Objects at or beyond this range may be partially or completely obscured, depending on the camera application.